DocuSign for Real Estate is a transaction management platform designed for real estate agents and brokers. Work for DocuSign for Real Estate? Learning about DocuSign for RE? "A Must Have For Realtors and Property Management"
No more faxing or emailing purchase agreements in a face-paced word of real estate. DocuSign for Real Estate has allowed me to focus more on selling, buying, and leasing properties instead of chasing down signatures and following up on missed initials. Creating templates of your most common forms is great. We use the same forms over and over again. You build the form once, then all you do is add the names and emails of the parties that need to sign and viola. Docusign chases down buyer/sellers signatures, sends out reminders, and notifies you when the document is complete. Overall I'm very satisfied. However, Transaction Rooms is a little clunky. Dotloop seems to be slightly better for collaborating between all the parties (escrow officers, lenders, Realtors, buyers, sellers, tenants, etc.) that need access to the documents. Also, Powerforms (permanent forms with dedicated URL's that anyone can fill out) is way expensive. In that regard, Rightsignature is a better, less expensive, route. Try out Rightsignature and Dotloop. You can get a free trial with both as well as DocuSign. We are a real estate brokerage that sells and leases properties. Having e-signatures is must. DocuSign has saved everyone in my office a considerable amount of time and makes us look more professional and streamline. We no longer have to chase down wet-ink signatures. This is one of the best online resources for real estate professionals. It makes getting documents signed so easy. It only takes a few clicks and you can get a document sent and signed within minutes. The best part of this software is it shows you when parties have viewed the document needed to be signed. This gives great insight into where the process of receiving signatures is. It allows you to see who still needs to sign the document and who has already completed their portion. There aren't many things to dislike with this service. The only downside is the inability to correct certain portions of a contract without having to void the contract first. This makes it slightly difficult to streamline the process of getting signatures in a timely manner. If you are looking for a service to send documents to clients to get signatures, this is your go-to resource. It has so many features and capabilities that make it easy to keep track of all of the important documents you need signed to complete any real estate transaction. It is very intuitive and easy to use. This is the easiest way to complete transactions in Real Estate. It makes it easy for senders and receivers to review and keep track of important documents in any transaction. It keeps all of my transactions in one, easily accessible place where I can refer back to them at any time. "Smooth and Easy With DocuSign"
DocuSign has so many amazing features that it's hard to choose just a few to review. DocuSign signatures are generally accepted by most lenders, title companies, real estate entities and most legal services. The signatures are legally binding, and don't require the signer to come into the office and sign each time a new document is created or required. Each signer has their own account, so documents that require joint signatures can be sent to each signer, they sign, and it's just as if they were in the office signing. The format for document creation is easy, and previous documents can be stored, copied and reused with newly added information, so there is no need to create a new document each time, if the user is creating similar documents. There is a notification of who has signed, who needs to sign, and the option of sending a reminder to those who haven't signed, to let them know of their needed signature. The entire process is easy, and automatically sends the document to each individual who needs to sign each document. DocuSign does not replace "wet" signatures that are sometimes required by specific lenders or government agencies. Most lenders are on-board with DocuSign signatures, but the government is old fashioned and makes things more difficult by not accepting DocuSign signatures. Hopefully they will come on-board soon. DocuSign is a no-brainer for every real estate agent/broker/office. Contracts and documents can be emailed to home buyers at anytime, day or night, signed, and returned in minutes. There is no need for clients to come to the office or meet away from home to sign documents. It's an absolute time save. In the fast-moving marketplace of real estate, DocuSign gets contracts and documents to buyers and sellers fast, and beats out other agents' offers who don't use DocuSign. Our customers no longer have to come into the office every time a new document needs to be signed. Once a customer sets up their own account, every document can be emailed to them, a notification shows up in their email Inbox, and they can DocuSign the necessary documents, and when the signatures are complete, the document is returned to the sender. Documents can be sent out day and night, and signers can sign at home, at work, or in the bathtub. It doesn't matter where you are, as long as you have an email account and internet connection. Real estate transactions can be completed without ever stepping into an office, except for closing documents. When tenants are using this product it is very easy to use and speeds up the process for signage of lease. Changed our business when we signed up and were able to do e-signatures. It's easy to use and we have found it's easier than the program we currently use. There is truly nothing to dislike, the ease of using it seems to be the most favorable. It speeds up the signage process and it is a secured method to process sensitive materials. Very easy to use for both Real Estate professionals as well as our clients. Using DocuSign has helped to increase our business and we love the ease of dealing with clients out of state, We receive immediate updates and notifications when documents are completed. "Docusign for Real Estate is a suburb tool for obtaining signatures on sensitive documents. " The ability to create templates for disclosures that are used in California is a big plus for me. Docusign has become very slow moving with all of the updates and redesigning they've done over the past few years. When I first started in real estate, things needed to be signed in ink. Which meant delivering the disclosures to the clients in person, or by 'snail mail'. Docusign has changed the real estate does business by certifying electronic signatures. I like that I can create templates for the most commonly used forms for my team. It's simple and looks professional. Sometimes I have to take additional steps before I can push the document out but it never takes me more than 5 minutes to get that squared away. If you create Templates for your most common forms it'll make pushing the forms out to new clients easier as you go along. The speed in which the documents are sent to the clients and then how quickly we can get them back and everyone has a copy. Sometimes my team will only take one physical copy of a form with them when they meet with clients and the client requests a copy or keeps it. When I go to file the deal and create an invoice I have to track down all the paperwork. That has been less of a problem since we started using Docusign. DocuSign is getting more and more popular and our clients are asking for it more than ever to help speed along deals. I wish you could have more than one admin for a document. My Assistant sends the docs and I get a copy but if I need to make a change I have to track her down while she is at her computer. Go slow setting it up. Un-sending isn't an option and mistakes create chaos and distrust. Speed and accuracy. Since it doesn't let people alter the document like word or .pdf we know people will sign in the right place and not make changes. "Excellent Digital Signature Software; Great for Beginners"
DocuSign's best feature is the fact that it is so user friendly. I was able to open it up and quickly figure out how to use it. The GUI is very intuitive and everything is really easy to find. There isn't much I dislike about DocuSign. We needed a way to get signatures quickly and easily on our real estate documents, and it met all of our needs. We only stopped using it because our broker invested in a company wide Dotloop implementation at no cost to agents. DocuSign really saved us a lot of time, in that we no longer had to meet up with clients for signatures. This made it much quicker and easier to make offers and get time sensitive documents signed and sent off. This is an invaluable benefit in the real estate world. It has a clean, easy to use layout, and it simplifies the process of getting documents signed by owners and tenants immensely. The daily reminder emails are helpful in getting customers to actually sign the documents. The power forms have also been helpful in sending documents to large numbers of people. We've run into a few problems with template sharing. Also, when updating a template, it would be nice if the signature lines stayed in the same spot instead of needing to replace them all when uploading a new but similar document to the previous version. There have also been a few glitches with documents being marked as completed but coming back, the signatures not having gone through. We mainly use it for signing management agreements and lease agreements. It is also helpful with other legal forms and several parts of our owner onboarding process. "DocuSign is a Must Have in Real Estate"
It is relatively easy for clients to sign. They enjoy the convenience and the speed with which they can respond to offers and counter offers. Not all of the changes made to the program have been improvements. Many recent "upgrades" require three clicks instead of one. I also object to Docusign trying to be EVERYTHING for real estate agents. We prefer not to store document trails on docusign and the program ASSUMES you will use those processes and makes it difficult for us to store our documents the way we would like on our cloud programs. We don't need docusign to do everything for us, we NEED the options to make out own choices about storage. Docusign is far superior to the "free" options available. It is worth the cost. Docusign allows us to turn documents around in minutes and respond quickly in volatile situations. "Easiest Way To Get Contracts Signed"
It's by far the easiest way to get your clients signing contracts quickly & easy. It works on any digital device and is very user friendly. Stop debating whether you should use it or not, and simply do it. It will make running your business that much easier! It makes getting documents signed by my out of town buyers quick and easy. I use DocuSign almost daily. It's easy to use on the desktop or mobile and is a lifesaver for a profession which is mobile and always on the go. The ease of use and flexibility to customize fields is great! A great feature to add would be the ability to circle/draw on documents. When working on RELO docs they sometimes require that options get circled, not crossed out which Docusign, to the best of my knowledge, doesn't allow. I would highly recommend this product to anyone needing to get signatures regularly for work or personal life. The ease of use is amazing and functionality, flawless. The only thing I would like for them to add to the program would be the ability to circle or draw on documents which some PDF programs can do. This would be helpful for foreclosure or RELO documents that sometimes require things to be circled instead of crossed out so having that feature would be an added bonus for users. I use this product every day and it has never glitched, or failed for me which is hugely important in the Real Estate business where sometimes every minute can count. It's so quick and easy to get documents signed and sent back with this program. I'm saving a ton of time being able to send this out for a signature and also able to spend more time with family when having to take care of things from home later in the evenings or on weekends. "One of the easy E-Signature Program out there." While docu sign is great for actually getting signatures, I wish it had a better transaction manager. For this reason I switch to digisign which is just as easy and is integrated into sky slope. If all you need is a good program to obtain signatures then DocuSign is for you. If you need more like file storage and a transaction manger then I wold recommend looking into something like sky slope which is integrated with DigiSign whichnin my option is just as easy to use as DocuSign. Being able to get electronic signatures has really revolutionized the way real estate agents do business. Clients love how convenient and easy the program is and I get to spend more time being productive. "Streamlines the signature process, integrates with other top programs"
Docusign allows you to collect digital signatures from all parties within a transaction and integrates seamlessly with Zip forms. It can be used from just about any computer or smartphone with internet access. The smartphone feature is great for those on-the-go clients. The subscription is not that cheap, especially after the initial 12-month promotional offer expires. I wish the company would make the promotional price the regular price for Realtors and other industry professionals. Take advantage of the 30-day trial, and search the web for promo codes. Also, if you are a Realtor, make sure you get the NAR discount. Check out the "Transaction Rooms" feature as well. Docusign is a great solution that saves time and headaches. Instead of having to email, print, sign, scan, and email back a document, Docusign allows you to get the signatures where you want them in incredible speed. It is also fairly user-friendly. I haven't had too many issues, even with clients who I would not describe as tech-savvy. Docusign web and mobile app are amazing. I love how easy they are to use. Being able to manage signatures, status of signatures, and set up signature requests on a mobile device is tremendous. It is very easy to use and visually appealing. The simplicity and organization is second to none. I have never had to explain to a client how to use the program because they become very clearly guided by the app/site themselves. The templates are great. In real estate we have a lot of forms that require a lot of signatures. Some of these signatures are in obscure places on the documents that would be easy to forget if we had to place the signature block each and every time we sent the document. The ability to save templates makes it easy for me, saves me a ton of time, and ensures that I'm not forgetting anything. I love being able to organize my documents into folders for each transaction. I love the ability to customize who gets what documents sent to them and when. I love the ability to add custom branding and customize what the users see. I love the ability to integrate with Dropbox, Evernote, and GoogleDrive. All of which I use. I dislike that DocuSign is really only a signature platform. Because of this I still need to hold accounts for Evernote, Dropbox, and GoogleDrive to organize my documents. It would be nice, in fantasy land, if the amazing technology and simplicity of DocuSign were inherent to one of my favored document management apps. I must say that they do a pretty darn good job of working around this concern with their ability to integrate those apps. Get it. It will save you time and brain damage. So much less labor intensive, eliminates endless email chains, and gives the requester one clean and legible document that is fully executed. "A well good app for home buyers and sellers"
The ease of use and most of all the overall concept is so good. The app makes the overall document process on buying a property more easier and digitally. This is very helpful for a buyer perspective as they don't need to carry all the paper docs with them. The app is very elegant on the UI side and is easy for use to every customers. The pricing itself, the don't offer very good incentives for a refer to friend. Also the pricing for corporate is a bit higher. Besides the pricing the app is a very good choice for everyone including corporates. Make the pricing more ease for common corporates. We have a real-estate consultancy in multiple countries and we used to work with papers, but as switching to DocuSign for Real Estate our paper work began to become less and also more efficient. Also the duplicates in papers are also eliminated. "Docusign meets and exceeds expectations"
The ease of use is the best thing about DocuSign. I have used Docusign for almost 6 years, and it's excellent. The customer service could use a little improvement. Don't get me wrong, I've always gotten help but sometimes it takes a few tries. In real estate there is a lot of paperwork, whether that is physical paper or digital. At times, real estate agents have clients that live far off (relocation clients) and Docusign bridges that gap. It saves time, money, and gas. "Has Made things much more convenient and efficient for me"
It has made improving the processes of getting contracts signed much easier. The mobile app gives me the ability to sign on the go. You don't have to worry about missing signatures, initials, dates, etc if you set things up right. It saves me so much time! Clients can sign from their mobile phone from anywhere. I wish that there were some better features regarding power forms included in the realtor price. If you are not using an e-signature platform, you must. Docusign has been fantastic for the price and I use it multiple times almost every single day. I am solving the problem of not having enough time to meet with clients every time I need something signed. Many clients do not have scanners and so it would delay them getting time-sensitive information back to me. This solves that. "Wonderful application when signatures are needed quickly!" Docusign makes it easy for me to get legal documents and files to my clients that requires their review and signatures. It saves time and money and hassle. I also love how it saves the files i send to my clients for later retrieval or easy forwarding. I'm not a fan of the the price you have to pay for subscription. i no longer have to rely on fax transmissions or email printing and scanning. Great product and onboarding. It does what is intended to do. However, as you will see below, I am displeased with the company. I am a small business owner. I contracted with DocuSign for electronic signature services but then my company went out of business. I did not use the DocuSign service one single time. DocuSign continued to charge my credit card despite this and would not let me out of the contract. I pled my case to the sales rep and even the CEO himself. No leeway was given, and it continued charge me thousands. Small business owners beware. DOCUSIGN has horrible business relations for the small business owner. This has become an essential tool in my real estate business. I am able to use this product on my phone, computer, or iPad. Instead of lugging papers around in a briefcase or car, I simply designate what needs to be signed and send it off to my clients or have it done at the site with their finger and it is sent directly to their inbox. No need for a fax machine or drive to and from multiple locations. There is not much I dislike about this software. Could improve by having the email address saved on mobile devices. It has made me more efficient with my response time for clients and other brokers. "A great way to save time and be able to sign documents from your own home"
There are two features about DocuSign that I really like. One is that the user only needs to sign or initial the screen one time, no matter how many signatures the documents needs which saves a lot of time. The other feature I love is that users are able to sign documents from the comfort of your own home at any time. This allows users to sign documents when it would otherwise be impossible to do so. The only item I can think of that I disliked is that DocuSign made it a little to easy to skip over important parts of the document. It skips to locations that need a signature or an initial, so it is important that the user takes his or her time to read the document or have a hard copy to read through. This program solves one of the biggest problems of availability. So often either a client or an employee have time conflicts when needing to sign documents and have a hard time meeting in person to get the needed signatures. DocuSign eliminates this problem as both parties can do it anywhere they have access to a computer and internet. I love the fact that I can sign a document, input text, date, include others to sign, and send the document out to others that need it. It's extremely helpful for when a seller needs to fill out an RECR and drag the check box over to indicate yes or no. It gives the client free range to fill things out accordingly. I receive a copy of the signed document once it's been signed. I love this program. I dislike that sometimes the program doesn't seem to be on time with signatures that have bee made. I wish for older clients there was a better step by step direction on what they needed to complete. Some clients are technically challenged and this program is a little confusing for them. Docusign is a must have in real estate. It is easy to use and a time savor. You need to invest in this program! I'm able to take docusign on the go. I can send and sign documents from my phone. This is a time savor for sure! Most clients like the ease of use and the fact that they can sign on the go as well. They aren't obligated to make time out of their busy schedule to sign documents in person. "Works for all my clients"
I love it that even non-techy clients can figure this out and sign documents quickly, saving them time and travel and postage. Poets and astrophyisicists alike have no trouble using this. Nothing so far! I have the use of a free e-signature program, but I prefer DocuSign and will keep using it. Try the free version and compare to e-Sign or another. DocuSign has worked for my clients in Australia, Hawaii, Europe and the Middle East. We would be spending days and weeks Fed-Exing things back and forth without DocuSign. Docusign is super easy for me as well as my clients to use. Very user friendly and great for agents on the go. I love that I can upload documents for signatures right from my phone and that my clients can sign right from their phones as well. With the market being as fast as it currently is, many times you do not have time to meet with clients in person. Docusign has been a lifesaver. I wish it integrated with more programs so that I didn't always have to download and save. Auto integration into transaction management software would be ideal. It really is just the best program out there for ease of use and professional appearance in my opinion. I haven't been overly impressed with their support but luckily it is rarely needed. "The Ease of DocuSign and Real Estate"
I love the simplicity of DocuSign! Being able to quickly email my client a link to a contract eliminates hours of legwork, or even long distance trips between you and a clients home. DocuSign is an idustry leader in electronic signature software, and is becoming more and more utilized through the professional field. DocuSign is a fantastic software, unfortunately, it was not as widely adapted as some agents wish for it to be. Sometimes a client, or even another broker may not have the time or patience to do an electronic signature, therefor they don't utilize the product as they should. When using DocuSign, it eliminates the need to constantly fax documents to a client, attorney, or another broker. The simplicity of using DocuSign has removed the annoyance of being unable to meet with a client because they are on vacation, or not able to meet with you late in the evening. "Easy to use, layout is a little "messy""
It's fairly easy to use, and it saves a lot of time. I like that it integrates with Zipforms. The way files are saved and displayed is a little unorganized, and it's not always easy to find forms that you've uploaded in the past. It would be nice if it had a layout more like Dotloop or Sky Slope. Also, I ran into issues when I didn't realize that a "signing order" was being assigned to the multiple signers I added for a document. What that meant was that before one person received the doc to sign, someone else had to sign. It seemed like a feature that just popped up one day, so it was very confusing. Customer Service was not easy to reach regarding the problem. It definitely makes getting signatures a lot easier and faster. For the most part, clients find it really simple too. Docusign makes my job so much easier! Most clients, even less-computer savvy ones, love it. They prefer Docusign over the hassle of printing and wet-ink signing! When I need a quick signature, Docusign is my absolute go-to tool. I never realized how handy it would be! "Easy to use legal digital signature"
The cost of it for what you get is absurd. I use digitalink whenever possible. Just use digital ink. It's safe and secure. Just takes a moment longer to load. It's so pricey and the up-charges are ridiculous. I've lost a lot of money just from needing to edit contracts and resend them. "This is the ultimate in portable office platform applications software." Highly Portable across platforms including cell phone, computer, and tablet. As such, a person can complete documents almost anywhere/ anytime. Too many notifications. Clients sometime get confused by getting too much information. For tech savvy clients this is not a problem but for the less tech aware it seems like they get too many notifications with every change of document status. FAST! No need to drive to meet clients. Just send the Docs and sign! Most clients quickly get the hang of the platform as well with the exception of the most extremely technologically challenged. The amount of time that docusign has saved the industry is astonishing. Driving back and forth to the different parties to get multiple signatures and fix any errors has been eliminated. Its extremely user friendly which is great for when you are working with people of all different ages and backgrounds. I also love the mobile component! Only thing I do not like about my use of this product is that I feel like I haven't learned to use it to the products full potential. Don't hesitate. DocuSign will save you a tremendous amount of time and wow all of your customers! Todays society is all about instant gratification and we have been able realize that and solve with this product. Some people do not want an electronic signature, should be a way (maybe i am not aware of it) to have the initial field duplicate itself at the bottom of all pages rather than pull it down onto every page, if you have partners or more than 1 person can be pretty cumbersome on a long lease etc. Lease agreements, purchase contracts , representation agreements needing signature without print off and scan and subsequent emailing. "The absolutel best electronic signature software in the industry!!" DocuSign is one of the most flexible applications that I have ever seen! I would like to take this opportunity to recommend them to anyone looking for a decent, trustworthy, and reliable platform, because with DocuSign, all your important documents are kept safe, and the signing process is as quick as it can get! I really have nothing bad to say about the experiences we all had with this company. Everything worked fine! The signing and printing processes are so easy to perform, and another great thing is that I haven't even stumbled across bugs that I could mention here. Their work is much appreciated! Having clients being able to sign real estate documents electronically is absolutely amazing and makes our jobs so much easier!! "Excellent tool for remote business"
I love that I am able to draw up a contract and have it to my clients almost instantly for review, signatures, and initials. I dislike the mobile platform. I wish Docusign had scan and go technology. The need to be with my clients in the office. Once a contract is drawn up they can go home and sign remotely. 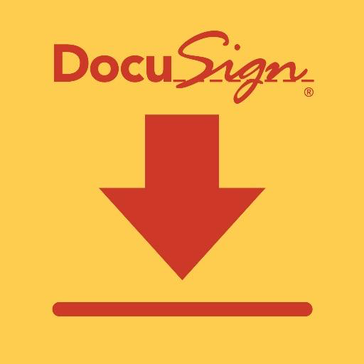 I like that DocuSign is an easy access app that allows one to collect signatures and send documents via email and/or text. I sometimes have trouble manipulating the app and feel that a recommendation would be to improve organization of the app. I have utilized the Docusign for various documents. I like that it saves as a pdf and can be sent through email, this makes the transfer of the document very simple and easy. "Great way to sign documents securely"
The initial tags are much larger than I would like to have in some uses. We can point to the use of this product to the increase in our productivity. We save a lot more time by getting signatures electronically which has led to an increase in sales. I used the app version of docusign and absolutely loved it. I'm always using my iphone and hardly ever in the office, so this saved me a ton of time by not having to go into the office. Two thumbs up. There is nothing that I dislike about the app. As I mentioned above, it saved me countless time by being able to sign for documents on the go. I'm never in the office and always on the go, so saving me time is saving me money. No recommendations for docusign at all. Keep up the good work. Time is the first item and for a real estate broker - it is the most important. Very easy to use. Ease of use, and user interface are excellent. Out of state/country clients love it's simplicity. Doesn't always auto populate fields correctly. This is an excellent product and will help your business by saving you time. It's largest competitor is DotLoop which is owned by Zillow and I would encourage all Realtors to stop enriching Zillow by using DotLoop as Zillow is actively engaged in undermining our business and shouldn't be supported. In the past when clients weren't local or were travelling you had to hope that they had access to a FAX machine and then by the time you faxed it to them and they faxed it back, legibility was typically significantly degraded, sometime to the point of illegibility. "Docusign makes life so much easier "
Docusign is super user friendly for both the desktop version and mobile version. I'm not sure that I would be able to get half as much as I get done on a regular basis without being able to electronically send my clients documents for e signature with docusign. It makes my life way easier. Sometimes it is frustrating when you notice a mistake and need to go back and make changes during the e signature phase. I wish you could pause, make changes and resume without losing any prior work. Keep up the good work. Keep updating and streamlining! With real estate time is money. Everything s time sensitive and being able to do work on the go and electronically makes it more efficient. "Using DocuSign daily for my administrative career in real estate. " Extremely easy to use! Definitely a must have for all real estate offices. I actually have no complaints, It is a great software for realtors and clients alike. You can sign from anywhere at anytime. Definitely use it! Especially now that it is automatically linked with ZipForms, it is an incredible resource. With Docusign you can sign any documents with the ease of a few clicks from anywhere in the world! (With internet access.) Its extremely beneficial for long distance transactions, or clients with hectic work schedules. "Docusign for real estate review"
This program is easy to learn & simple set up for any one to use. it will saves time & money. it is easy to use & quick. Whats not to like.there is nothing that I don't like. every body can use this even for personal use or other type of business. I like it & use it for all my clients that have emails. Not to have to meet my client every time I need a signature will save me time & money. The ease of use for the recipient. I have on many occasions sent agreements to out of town clients for signature and they have really appreciated the ease with which they can quickly sign and return documents without having to find a place to print and scan back. Have not found anything I dislike about the services. Try it and experiment to see how it works in your workflow. Ease of electronic signatures with non local clients. Faster turn around on initiating engagements. "Easiest way to have your clients E Sign Something"
I've used docusign for over 2 years now, and I've also used a few other E signing programs. This one is always the easiest for my clients to figure out, and does not seem to have the glitches some of the other e signing programs use. No Major Complaints. It works great overall. It is the easiest one for clients that I have seen. Being able to have someone e sign on their phone with such ease really saves a lot of time. "Docusign makes the paperwork process easy!" I love that I can email all docs for signature-- whether my clients are out of town or down the street. So convenient for both agent and clients! I have no significant dislikes of Docusign. It works great! If you don't use Docusign... you are missing out. I can't imagine a real estate transaction without it. I am able to expedite the paperwork mountain in real estate and do it efficiently. My clients are impressed with the ease of completing documents. The simplicity of using this product, and the ease for everyone using it. Front running in what they do! Nothing in particular. I think that most of the issues come from lack of familiarity. They seem to be the front runner in this line! Simplicity in sending documents via the web that need signatures. It has saved so many trips to offices and reduced the amount of time it takes to get signed documents back! Pricing could be more competitive, I don't like that if you leave a broker, even though you have paid for a year of service you lose the access to the account and no way to retrieve any of those docs. I lost all docs in a deal, and a full year of paid access. Not please, haven't used this vendor since. Signing remotely from any location on earth with Internet access is the biggest benefit. When I'm on vacation abroad it's the difference between a deal coming together and one never happening. "Docusign Makes My Life Easier"
Getting lots of signatures at once. A literal click of two buttons means I get the documents signed as needed. Not enough signing space sometimes for more than 3-4 people. Docusign could help us significantly in collecting information from property owners who have a hard time understanding our processes. If we can provide them with the documents they need then it's more likely they'll return those documents to us quickly. I love having templates that are set up with the signing spaces. I do think that docusign should make it easier to sign documents when more than 4 people are involved, but that difficulty might just be due to the page size. It moves the process of getting documents signed over quicker than ever. Also it most importantly, is very user friendly and easy for our clients to use. Sometimes the program doesn't save contacts but that happens at random, other than that it is a great program! I am solving the problem of having to wait for documents to be scanned or faxed over because this cancels that process. Learning about DocuSign for Real Estate? * We monitor all DocuSign for Real Estate reviews to prevent fraudulent reviews and keep review quality high. We do not post reviews by company employees or direct competitors. Validated reviews require the user to submit a screenshot of the product containing their user ID, in order to verify a user is an actual user of the product. Hi there! Are you looking to implement a solution like DocuSign for RE?